A guide to the young and the aged, the great and the exceptional, and turning what’s very good into something outstanding. 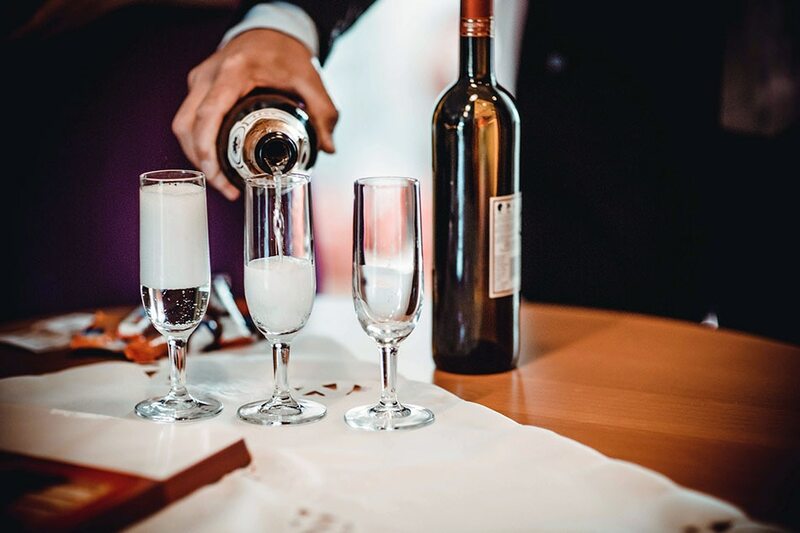 Contrary to popular belief, Champagne can age, developing flavors of bread, biscuits, nuts, and coffee in older bottles. For wines currently in the market, 2002 is the vintage to buy. Consider yourself very fortunate if you can find Dom Pérignon or a Laurent-Perrier from 1996. Also excellent from that year is Henriot. I have also had many good experiences with wines from 1999. Pol Roger, Delamotte, and Gosset, in particular, are quite good. For Krug, the basic Grande Cuvée, which is a non-vintage, is reckoned to be on par with the prestige wines of other houses and will age just as well. This may have the lightest stain of pink I’ve seen in Champagne. Tart green apple flavor. Very fresh and a little spicy. Youthful and just starting to pick up some coffee notes, but no yeastiness or bready flavors. Tons of fruit and great length. This wine is still a baby with many years ahead of it. Excellent now, but with the potential to be outstanding with time. Tasted August 2009. Light gold with bubbles that rise rather quickly. This is obviously very young with a great deal of fruit showing. It is remarkably well-rounded for such a young Champagne, but it does have some weight and richness behind it. There is not a great deal of layering now, and the nuances are rather subtle. However, it does show some white chocolate and a creamy café au lait character. It finishes long and gentle, avoiding the citric acidity that can afflict a young wine. This is a rather forward, precocious wine that is already enjoyable now. At this point, very good with potential to be outstanding with time. 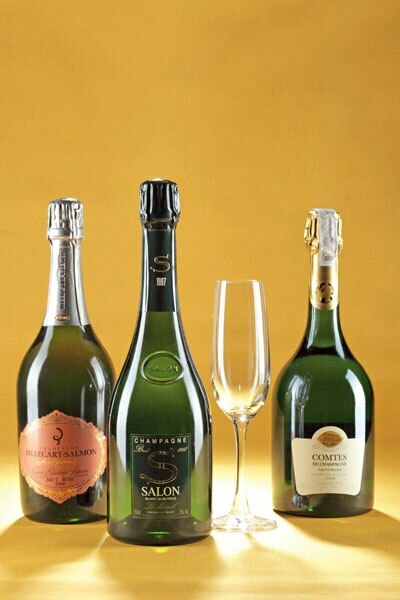 L-R: Billecart-Salmon Cuvée Elisabeth Salmon Rose 1998, Salon 1997 and Taittinger Comtes de Champagne 1995. Light gold. Toasty, bready nose. Still crisp with the fruit quite evident but it’s rounding out giving another dimension to the wine’s complexity. Great depth of flavor. Hints of tobacco, nuts, and some chocolate. Already showing tertiary development, but still lively and possibly just middle aged at this point. This could go on a couple of more years without too much trouble. Good length. Excellent Blanc de Blancs. Tasted January 2012. The 1999 (pictured) also shows good promise. Quite pale. Clean lemony nose. All primary fruit at this stage but with good weight and depth of flavor; mostly lemon with a hint of yeastiness. Dangerously easy to drink. I finished this in no time at all. Finishes long with some orange rind. Excellent and a great substitute for Salon. 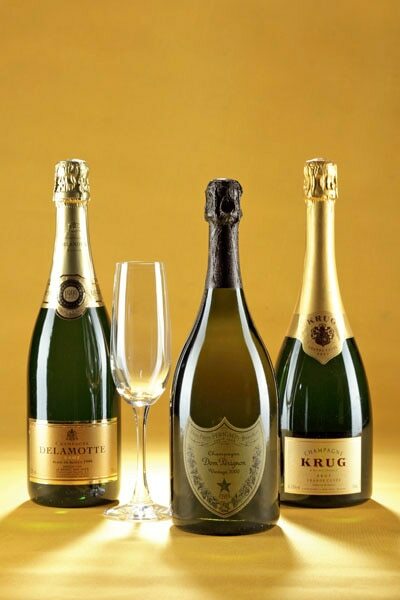 L-R: Delamotte Blanc de Blancs 1999, Moët & Chandon Dom Pérignon 1996, and Krug Grande Cuvée. A bit lean for Dom, so that indicates it is still very young. Though the weight was wanting, it definitely had all the complexity you could ask for, showing candied lemon rind, tobacco, nuts, and coffee. Youthful, but very attractive. Bready notes coming through as well. A second bottle was even better with more fruit, roundness, and the additional complexity given by sweet spices. Leave alone for another five years, but this is great Champagne. Tasted November 2011. (Purchased in 1996, before the French luxury group LVMH bought Krug.) Medium copper/gold. Still vibrant with many fine and persistent bubbles. Unbelievably fresh. Just a touch of an oxidative character on the nose. Complex, deep, many-layered with flavors of tobacco, lemon peel, sweet pastry, and brioche. As it developed and warmed up, coffee and later toffee flavors emerged. Medium to full bodied. Probably at peak now. Brilliant Champagne. Tasted December 2011. Light gold. Medium weight. Deep, complex flavor of nuts, lemon peel, and marmalade. No toasty elements showing up on initial pour, but developed the toasty, bready character after being exposed to air for more than an hour. Extremely long and bursting with life. This could age for another decade without too much trouble. 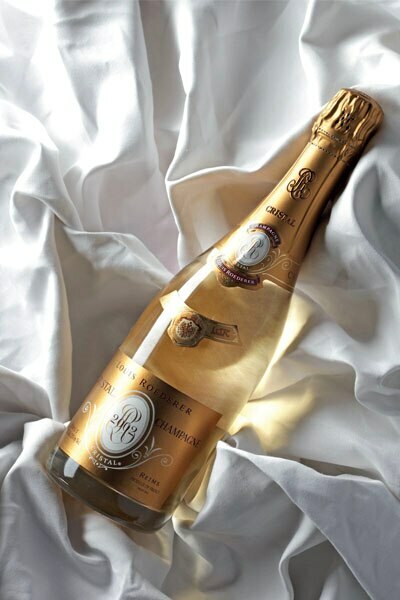 Exceptional Champagne approaching perfection. Tasted February 2009. This story first appeared in Vault Magazine Vol.5 2012.